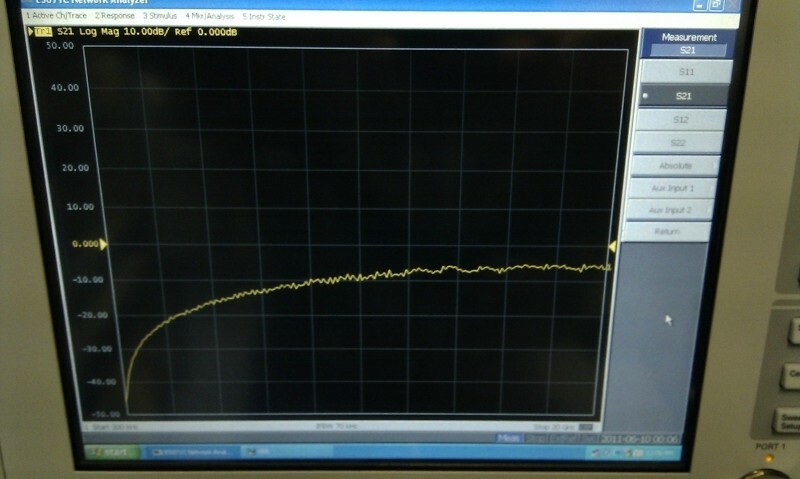 We have an issue with our E5071C Microwave Analyzer. Basically we're connecting a cable from Port A to Port B and monitoring the results. S21 and S12 are showing strange results. Anyone know what the problem could be here? We've tried 2 different cables, but both give the same reading. 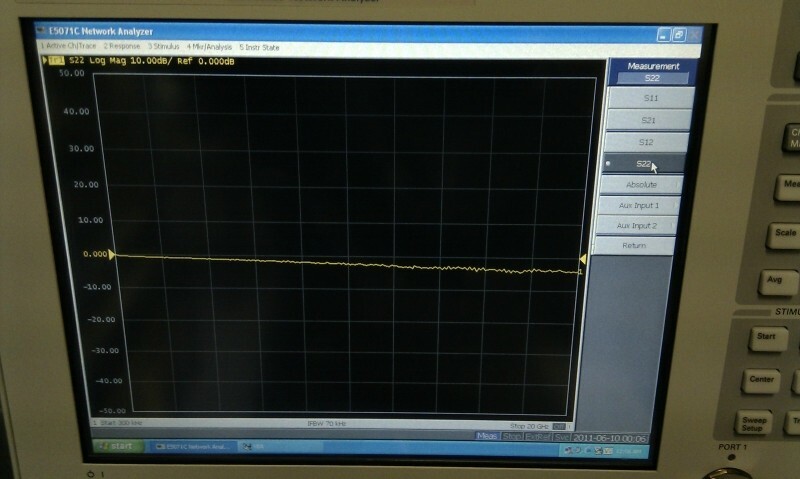 We have an N4961-60006 Ecal module, but when we try to do an Ecal of any kind we get error "Ecal module not in appropriate RF path"...even though the Analyser sees it ok.
possibly there is an open-circuit problem inside one of the test port couplers. 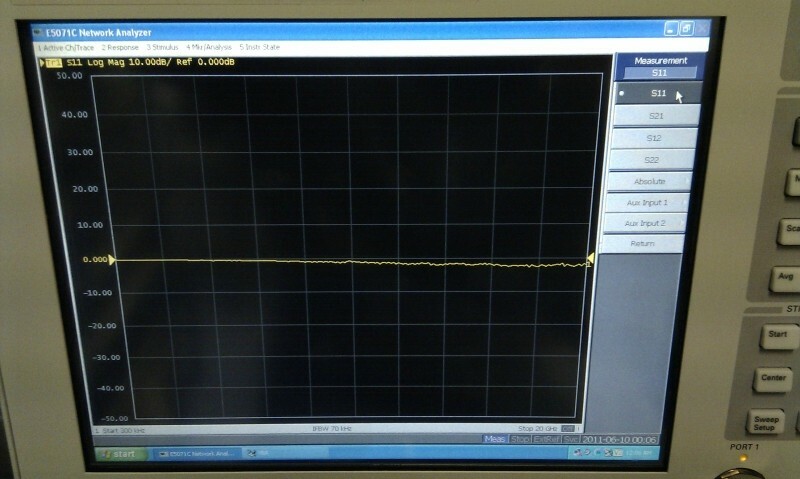 This would make reflection of an open look normal, while transmission shows a roll off at low freqs. Try putting a 50ohm load on port 1 and port 2, this may show which test port has the problem. 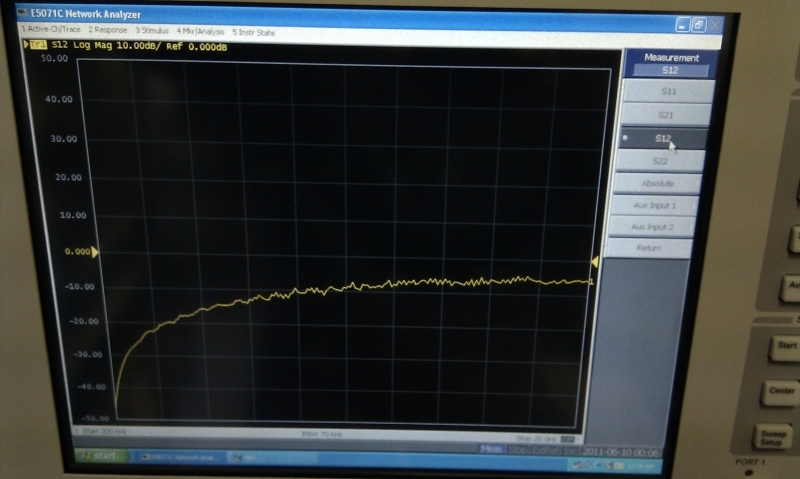 It looks like there is a ~ 40dB roll off at low freqs - this would prevent the analyzer from "seeing" the ECal module when it measures reflection and toggles the ECAl impedance state. If my guess is right, you should be able to do a 1port calibration on either Port1 or Port2, but not both. I tried putting a 50ohm load on each port and strangely, they both give very similar readings. Someone did suggest to me that the Ecal module wouldn't be seen because of this roll off at low frequency, so I guess your comment confirms this. Unfortunately, we only have the ECal module, and no other cal kits, so am unable to do a 1 port cal. Not sure where to go from here. Looks lik e we may need to arrange our local Agilent tech to come have a look.